Four people don die wen one fuel tanker jam container trailer and catch fire for Lagos-Ibadan expressway, southwest Nigeria. Na Punch Newspaper dey carry di tori. Di Public Relations Officer, Ogun State Traffic Compliance and Enforcement Corps, Babatunde Akinbiyi talk say di trailer jam di side of di tanker, na im fuel come dey pour before e catch fire. According to Punch, dem carry tori say di Ogun State official confirm say four people die and di tanker still dey burn and e don cause hold-up for di expressway. Di accident happen for Ajebo side near Foursquare Gospel Church camp. 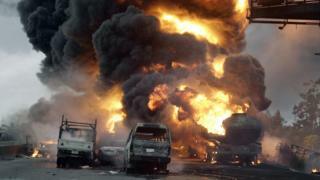 FESTAC fire: Wetin dey cause petrol tanker accident for Nigeria?